I am loving being in The Secret Recipe Club, as I have met so many bloggers! The time difference is the only thing that does not work well for me – the afternoon’s for me are busy, and so I only get to the posts the day after they are published. This month my assigned blog is Good Thymes and Good Food. Rachel is originally from Florida (where some of my family live) and she now lives in Atlanta. I have been to the airport there countless of times, but have never been out of the airport as I have always been in transit. Rachel is a stay at home mom – how blessed her son is 🙂 I could not resist her creamy pasta with beef recipe. As I also participate in Presto Pasta Nights and my draft folder is empty of pasta recipes, I chose the first pasta recipe I found on the blog, Creamy Pasta With Beef, Sundried Tomatoes And Mushrooms. It had so many of my favourite ingredients in the recipe, I knew it would be great, even before I tried it. I chose not to do a holiday recipe, as that is the farthest thing on my mind right now. This is the busiest time of the year for me work wise. I made a little extra for the freezer – there may be a night soon that I don’t have time to cook! To see more recipes from please click the linky tool below. Mushrooms and Pasta = Winning Dish! Thank you for sharing this wonderful recipe Tandy. I like the fact that it has the pasta, the meat and vegetables all in one , making it an easy and delicious option for the whole family! Always wonderful when you share a dish with Presto Pasta Nights. This one will be high on my list of meals to prepare for those over the top busy days ahead. I love meals that leave some for the freezer. This looks great. I love a meal that provides extras for freezer. This looks great. 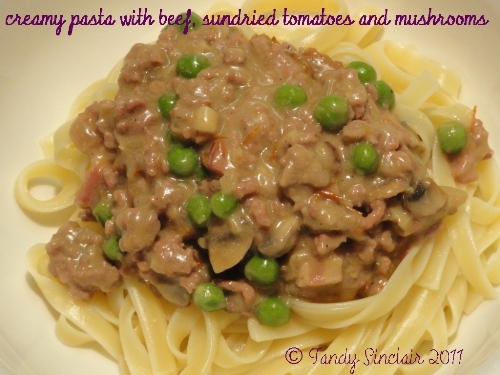 I love this creamy ground beef version and it has bacon too! I can’t wait to switch up to this from my basic ground beef with peas!!! Great find Tandy! Glad you’re having a good time in the recipe club. What a great idea. And love the look of your pasta. I think I’ll cook pasta tonight! this looks like pure comfort food! fab recipe to share on SRC! I love the sun dried tomatoes in this. It sounds amazing! This pasta dish looks delicious, like the idea of sun dried tomatoes all in a creamy sauce. What a yummy recipe!!! I love the ingredients, especially the sundried tomatoes! This sounds so comforting; I can always find comfort in a big bowl of pasta! Sounds wonderful… love pasta with anything! That sounds like it has such a great flavor. I have a weakness for pasta with lots of sauce. Looks really delicious! Good call making a pasta so you can use the blog post again. Very productive! I hear you – I can tell this is going to be a tasty recipe for sure! Love all the yummy ingredients. I hope you’ll stop by to visit my SRC reveal – Ganache Filled Snowflake Cookies. Yum. That’s such a unique combination of ingredients for the sauce. Sounds tasty! Thanks for sharing. I”m so glad that you enjoyed this! I haven’t made it in awhile but I do remember absolutely loving it! Looks great. I don’t think I would have thought to put this together, but I think it’d be tasty. I’ll have to try it out. What a great use of mince Tandy. Looks delicious. Looks delicious! It’s not often you see a creamy sauce with ground beef – I know I would love this! Your Creamy Pasta look’s delicious we would really enjoy this dish. It is fun cooking with you at the SRC, have a great day! This looks delicious. We are a pasta loving family, so I’m always looking for new recipes to enjoy!